Pete North Politics Blog: Dunkirk spirit? Mine's a double! I often wondered if Polly Toynbee served any function at all. It turns out she does. She does a better job than any big data robot in gathering up all the known glib cliches and distilling them into a single article. It's state of the the art remainer smuggery. This week she sets up the straw man of the moment to knock it down with consummate ease. You see excitement in Brexiter eyes, but their tone has changed. Once they promised lavish trade, a Shangri-La of milk and honey, a deal with the EU “the easiest in human history”. So far, no trade deals have been signed. Today they offer only blood, sweat and tears. They have become survivalists, heroically tightening the nation’s belt. Their romantics, such as Charles Moore, flippantly yearn for hardship. “I am just old enough to remember when fresh fruit and veg were in short supply at this time of year. People used to know how to store things to mitigate the problem: apples would be carefully laid out on straw-strewn shelves. We ate lots of root vegetables and not much greenery … Perhaps it is time for a Brexit recipe book, like those comforting wartime rationing ones.” Bring back the glory days of smuggling, let us “set out in our little ships to Dunkirk or wherever and bring back luscious black-market lettuces and French beans, oranges and lemons”. Oh, what larks! The homefront is taught in every school and local museum, often with a misleadingly cosy glow from propaganda posters where happy families eat up their Woolton pie – potatoes, carrots and turnips in pastry – deadly dreary, according to my mother. I wasn’t born in the war, but during postwar austerity I remember going to the sweet shop with ration books. In phone-ins, older Brexiters say, “People these days have more than enough. 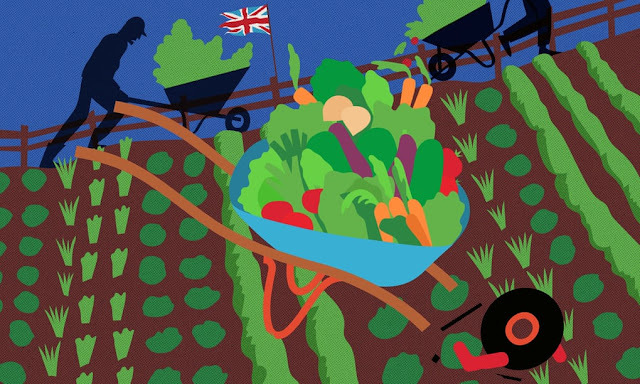 It’d do them good.” Imagine digging for Brexit – how many potatoes, cabbages and tomato grow-bags might your garden fit? Look in the wardrobe and think make-do-and-mend, no need for new stuff. It will be good for the planet, good for national moral fibre if shortages bring communities together. I’ve heard people in supermarket checkout queues, only half-joking about stockpiling that extra packet of pasta, waiting for the adventure to begin. As ye know, this blogger has never been carried away by any promises of sunlit uplands. I have spoken with ambitious optimism about future trade potential but have generally taken a cautious tone about the short to mid term, which is in part why I prefer the EEA option. It's really only the London Brexit blob who've banged the drum for free trade, generally speaking from a position of total ignorance. Outside the bubble, however, most leavers I speak to are under no illusions. They know it's not going well, yet the more they see of Brussels the more their resolve is hardened and increasingly in the direction of no deal. Though the dire consequences of no deal are written off as "project fear" by the Tory blob, more generally leavers now accept that there are going to be serious problems even if we don't see armageddon on day one. That though, is no deterrent. There seems to be a bloody minded determination to simply get on with it. They are almost sanguine about it. In part this is born of naivety in that it's a bloody long time since the UK faced real hardship but there is also a stoicism because whatever the price of Brexit, they are willing to pay it and look for whatever good in it they can. Here we have seen some of what Toynbee alludes to. I'm not exactly innocent on that score and I'm not at all surprised to see romanticism from idiots like Charles Moore, and she is quite right to throw a bucket of cold water over austerity nostalgia. But only to a point. What our Polly might have overheard at the Waitrose checkout has a certain folk wisdom to it. But then if people do hold these ideas we really must ask where they get these silly notions from? I mean, it's not like there's a newspaper that thinks there's too much food waste and that we must stop using single use plastic bags. There isn't a newspaper that complains about high food miles and its impact on the planet. There isn't a news paper that makes a moral virtue of make do and mend and freecycling our way to a more ecoconscious life. Certainly I've seen nothing promoting allotments and growing your own food. And certainly there is no newspaper advocating a return to seasonal food. If such a newspaper did exist it would, for instance, suggest that schools should serve locally sourced food. It would perhaps draw our attention to how Spanish salad growing was a hotbed of modern slavery and pollution. I just can't for the life of me think where people would get such backward ideas from. I'm sure that if such a newspaper existed Ms Toynbee would rightly tell us to completely ignore it.